The Paradise Institute (2001) is a video and installation project at MOCA by Janet Cardiff and George Bures Miller. I sat though the 13 min. long video and I had the impression I was part of the video, part of the audience, and a distant observer at various times. The sensory experience is incredible and the installation is perfect to allow complete immersion. I saw Kate Gilmore’s exhibition at MOCA. Loved this installation Love ‘em, Leave ‘em and the video of this performance. A couple of years ago I picked up a used copy of this book on Lee Miller by Carolyn Burke. I knew Miller had been a photographer but that was it. It turns out she was probably one of the first under recognized female photographers of the 20th century. She was an early feminist and wore many hats. In her life, she had been a model, a muse, and a gourmet chef. Her beauty made her a legend. She modelled for Vogue and for several artists such as Picasso, Steichen, Man Ray, and was featured in Cocteau’s play 'Le sang d'un poète'. She was a bit of a fashionista too. When fabric was rationed during WWII, she influenced fashion sense by making recommendations on how women should wear their uniforms. When it comes to photography, my favorite photo of Miller is ‘Portrait of Space’. I love its minimalism and its surreal effect. In the late twenties, Miller was Man Ray’s lover, model, muse, and assistant. They formed a successful partnership producing Surrealist art. “Portrait of Space” could be seen as Miller’s need for escapism. The photo was taken when she lived in Egypt in the early 1930s after marrying an Egyptian businessman. On several occasions to beat boredom, she would load up her car with food, maps, and her camera gear and take her friends out to the desert for days at a time. As good as she on both sides of the lens, she was also a good writer. (A skill I’m always working on!) She was the photographer/correspondent for ‘Vogue’ and covered the war in Normandy and Hitler’s Germany during WWII. She wanted to be there at the front, which was unusual for a woman of her time, let alone as a photojournalist. I like her images of that period: she didn’t have the deadpan style that most photojournalists tended to use. Her Surrealist style resulted in interesting tableaux. Miller’s biography is a good read. I felt teleported to another era living vicariously in the skin of Lee Miller. I enjoyed it because I saw in Miller a woman who was talented, unconventional, and a good photographer as well. Having followed the making of the Marina Film Project online for the past year, I finally had the chance to watch this long-awaited documentary on the performance artist Marina Abramović, “The Artist is Present”, directed by Matthew Akers. The film scores 95% on Rotten Tomatoes. I’m not surprised the film received such good ratings. Abramović is a very unique performance artist who has incredible fearlessness and physical and mental endurance. Whether it shocks or not, it’s hard to ignore her work. She is an amazing artist. The first part of the movie was my favorite. Watching the lead up of Abramović’s most important career performance at MoMa this year, “The Artist is Present” was really exciting. I also liked the way the film was edited: there’s just enough information about Abramović’s earlier works to give the audience some background. Another point is the film doesn’t have a monotonous and serious tone that some documentaries have. It’s really easy to get into it. The film “The Artist is Present” is worth watching. Julia Sherman, Farewell Miss America 1969 - Re-enacted by Flawless Sabrina, Founder of Miss (Drag) America Pageant 1954, 2012. Excerpt from two-channel video installation. Courtesy the artist. Miss America 1969 (left) delivers her farewell speech only to be interrupted by the sound of protestors, inaugurating the Women’s Liberation Movement. Flawless Sabrina (right) delivers a reenactment of the speech in his home in 2012. The Queen, a 1968 documentary film about Sabrina’s long-standing drag pageant inspired the feminist protest of the 1969 Miss America pageant. Sherman currently participates in SculptureCenter’s 2012-2013 In Practice program, culminating in an exhibition of new work. Double Life opens at SculptureCenter on January 13, 5-7PM and runs through March 25. Blue Days (1996) (see left) where Bourgeois used steel, cloth, and glass. Bourgeois’ artistic drive stemmed for the major part from her relationship with her father. She also explored her feelings about her mother, her identity, her anxiety and her loneliness. Some of her writings are powerful. As art was a form of catharsis for Bourgeois, she managed to deal with her inner demons in way that forever changed the contemporary art world. In 1969, the Venezuelan artist Carlos Cruz-Diez put together 22 chambers where red, blue, and green plexiglas cabins were used to stimulate the viewer’s emotions through a spectrum of colour. I love the idea given what was then happening in the world. Cruz-Diez is based in France and is known to have changed how colour is perceived in art. His website is worth checking out. According to his artist’s statement, color is an autonomous reality, devoid of anecdotes, that evolves in real time and space with no need of form or support. Today, I dropped my prints in at the CCP for the Kodak Salon competition. After catching up with the staff I used to work with, Christina, the Front House Manager, pulled me aside to show me the CCP website front page: my pink and blue image or Crush, is featured. What a surprise! The opening in next Thursday Nov. 22nd 6-8 pm. If you haven’t seen the Gregory Crewdson’s show In a Lonely Place yet, hurry as it ends this weekend. Crewdson is best known for his highly constructed images which resemble film noir stills as seen in his series Beneath the roses 2003-2008. I’m a big fan of that series because of the way it conveys drama and mystery. Also, it’d be every photographer’s dream (or maybe just one of mine) to have the ability to turn a whole street into a set for a photo shoot and have access to a large crew just for lighting. The production involved behind each photo is undeniably impressive. The detail in these large format photos is amazing. Crewdson takes staged photography to another level. 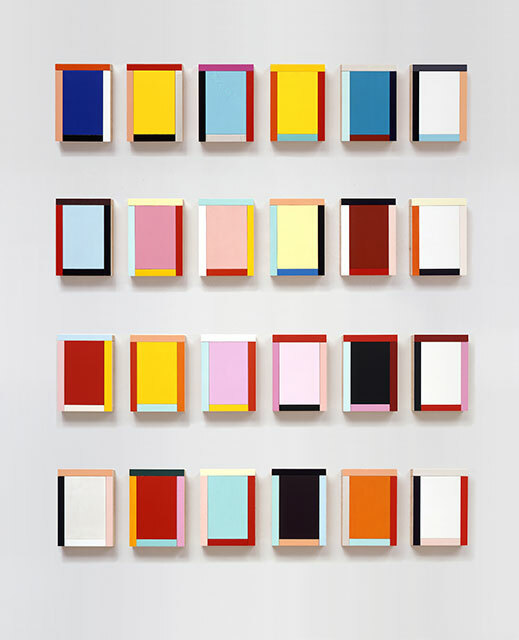 I Love the minimalism of this German painter, Imi Knoebel. Chocolate (2010) by Martynka Wawrzyniak makes you wonder how the artist reacts to chocolate after such a performance. This past weekend, I stumbled on an essay in Paris Review entitled 'When I look at a strawberry, I think of a tongue', by the late French artist Édouard Levé. Three photographs of Levé appear in the essay. I had never heard of him before. He was a self-taught artist, writer, and photographer. His essay was quirky, amusing, and familiar. It was an excerpt from his book ‘Autoportrait’ (review here). He writes without paragraphs and linear thoughts which I found very easy to read. I took a look at his books of photo series and noted how a lot of his works were staged. Also, there is humour in his works. Who knows how tormented he really was as he committed suicide in 2007, 10 days after handing in his last book ‘Suicide’. Katya Grokhovsky , is a Melbourne artist and a VCA graduate, originally from Ukraine. She now lives and works in Brooklyn. I saw part of her 8-hour performance at Odessa Studios here in Melbourne where she explored homesickness through voice, dance, and food. At a certain point in her performance, Grokhosvky eats a lemon, with the peel on, and spits out the seeds. This reminded me of Marina Abramovic’s piece ‘The Onion’, where the latter ate a raw onion while complaining in a voiceover about her life. Grokhosvky definitely explores the limits of her mind and body in her practice. Here’s an interview by Art Fag City where she speaks about her work in her Brooklyn studio. I was at the opening of the Grid Show at the George Paton Gallery this Wednesday. I was looking forward to seeing how the other artists filled their allocated gridded space given the 2 meter square restriction. Several of us, including me, produced very different artwork to what we had anticipated. This shows how there can be more than one solution to a problem. My art work has been closely intertwined with life events. But then again, whose work isn’t? I had mapped out this grand project and then, I changed everything. I knew from the start I was going to do an installation, for a change. I had attempted to finish my piece for the Grid Show before my daughter’s birth. Your own child’s birth is always a life changing experience. Even more so if it was highly dramatic, as it was the case for me. Admittedly, I had contemplated the idea of dropping out of the show. Then, I decided to take the opportunity to work with what I had. I simplified my original plan. Louise Bourgeois was an inspiration for my work. Motherhood, birthing, and vulnerability were also explored in this piece. In the end, I’m glad I stayed in the Grid Show. When it comes to create, I learned to be open to the unexpected and to use restrictions as a challenge to try something different. If you want to see how Simon Pummell used 3-D effects to explore technology, psychosis, and society, then go see his exhibition ‘The Sputnik Effect’ at Seventh Gallery. Pummell is internationally renowned for his works with moving images. This exhibition accompanies Pummell’s feature film ‘Shock Head Soul’, playing at the MIFF which I have yet to see. Besides having recently watched 3-D movies, this was my first art exhibition which supplied 3-D glasses for viewing. In the main space, there are framed prints of jellyfish-typewriter-like hybrids, or ‘Writing Down Balls’, floating in space (see above). My favorite piece is the video projection in the back room. The video is a combination of animation and CGI modelling. A naked bald man is contorting and changing shapes on a floor. This reminds me of Julie Rrap’s 'Fleshpool' (2004) . There is something haunting in Pummell’s video piece with the grunting sounds combined to the ‘Writing Down Balls’, in 3-D, emerging from the screen right to the center of the room. The show is about madness meets science-fiction and has been inspired by Daniel Paul Schreber, author of ‘Memoirs of my Nervous Illness (1903)’ and the early typewriter, the ‘Hansen Writing Ball’ (1865). I’m not familiar with the art of making video animation and CGI modelling but I like how Pummell challenged the boundaries of 2-D works on paper and on video. I’ll be part of this group show, as one of 20 VCA students. We were given a 2 m square space. Come and check out how we explored our space creatively. Analogue photography is alive and well. Proof may be found in Janina Green’s latest series ’Be Home Before Dark’, currently showing at the Colour Factory. I attended the opening: Janina Green is one of my VCA teachers/tutors. The images were taken in Gippsland where she grew up. The series represents some of the artist’s feelings ‘of fear and dread' associated with arresting landscape images. I liked the fact that the large prints were unframed, borderless, and stuck directly on the the walls with velcro. The images were shot on film, hand printed, and hand toned by the artist. For this exhibition, two kinds of blue paint was used on the walls. The resulting effect accentuated the blue tones in the prints and also worked well with the heavy black tones. I admired the craftsmanship involved in the series. Green effectively conveys a personal experience in a minimalist manner. the surface of the wax-made wood-like sculptures. The way the artist combined the human and plant world is fascinating. Perhaps, the idea of blood underneath the trunk barks is crossing the line for some viewers, suggesting the grotesque. As de Bruyckere mentioned in an interview for ACCA, there is something to be more perturbed about with the violence found in everyday news. She is right. Being reminded of our mortality with art can also be frightening. Needless to say, the way de Bruyckere explores the concept of mortality and human vulnerability is aesthetically pleasing and worth checking out. I see some similarities between her work and Louise Bourgeois’ and Kiki Smith’s, whom I admire both. Patricia Piccinini had listed de Bruyckere as one of her inspirations. From now on, both Piccinini and I have something in common.